I have a butterfly in a bottle on my desk. It is not a real butterfly, it is fake. There is a wire attached to it and it is battery operated. 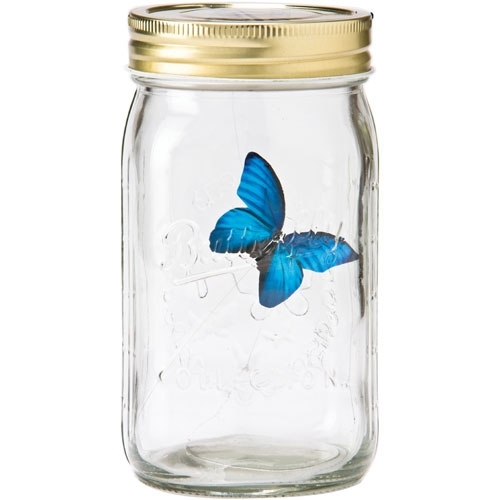 When you tap the top of the bottle, the butterfly flutters and flies and flaps its wings. It is absolutely convincingly real. I am fascinated by it and it is a symbol for me. Perhaps it is the ingenuity of the design, or the fact that it is so believable. I would love to be able to create something like that. Maybe it is because the butterfly is trapped and can’t escape. I can really relate to that feeling sometimes. It could be that the butterfly contains the idea of transformation. I am not sure what it is exactly though. It could be a symbol of creativity, ingenuity, freedom, change – any one of these could be the cause of my love for this little gadget. When we see images, logos, numbers, anything that we know what it means immediately, e.g. a stop sign or a McDonald sign, it is a sign, not a symbol. A sign is exactly what you see, nothing more. The meaning is obvious, i.e. if it is a stop sign, you need to stop. A sign has no energy that keeps enticing you to entertain it in your mind. It is an object like so many in our environment. A symbol’s most significant characteristic is that you are not fully aware of what it means to you. So the number 13 could be a sign, if it refers to the number of items. But if you believed it to be bad luck and you avoid it at all costs, it would be a symbol. Let’s say your lucky number is 35. You always choose that number if you are asked to choose a number, and perhaps you have a screensaver with the number 35 on it. It is a symbol, because you cannot clearly state why you believe it to be lucky or why you favour that number. Perhaps there is a memory attached to it, but it has some meaning other than the number of items it represents. The second indication which points to something carrying symbolic meaning for you is emotion. When you experience positive or negative emotion towards an object, image, pet, book, movie, series, etc, then there is symbolic meaning in it for you. It can sweep you away, entice you, fascinate you, mesmerize you, but it evokes a definite reaction from you. One of the most important uses of symbols are that they energize the psyche. Consciousness cannot create psychic energy. What I mean by psychic energy is that type of energy that revitalizes you, that infuses you with enthusiasm and moves you. That type of energy you have when you are excited about a new project and jump out of bed in the morning. Or you meet a new lover and all you think about is them. Or you are dealing with a frustrating problem and you spend nights thinking about it. This energy is created by the unconscious and appears as symbols to us. If you have a problem, you may talk to your friends about it, you think about it, you daydream about the solution, you try to look for a solution by Googling all kinds of stuff and the list goes on. This process can take days, weeks, months and even years. I can guarantee you that unless you find a symbol that energizes you, you will not move, you will stay stuck. These symbols are gifts from God in a way, they are acts of Grace. I find that when I have to write a blog and I don’t have a symbolized idea to write about, it is like pulling teeth. Painful and excruciating! But when I am inspired and my symbol pulses with energy, I will write my blog in 40 minutes and love every moment of it. I recently heard someone talking about how they always speak to their friends about their problems and hope that they get some solution from them. Of course they get loads of suggestions but nothing sounds right, until one person says something that just hits home and the penny drops. It may not have been different to the other suggestions, but the way it was put, the phrasing of it, that worked. This is what I am talking about – an image that resonates. Symbols come in many shapes and forms. It can be something you saw or read. It can be an idea or ideal. It can be a song that is stuck and repeats itself over and over again in your head (this is apparently an earworm :)). Think about your favourite food. It is full of symbolism for you. If you are a health nut, your favourite food may be Sushi. When you eat your Sushi, it will fill you with feelings of being healthy and nutritious. You have added years to your life, you are kind to your body, or add here whatever you feel it does for you. Sushi is a symbol to you, because when you eat it, you take in more than nori and rice and avo and salmon. What about your favourite painting or book or actor. They all represent something that you can’t explain consciously. You may think that you know, but there is a lot going on for you that you are unaware of. Each one of us carry these symbols with us and relate to them in a very personal and intimate way. No one else can understand how your symbols affect you and move you. These symbols make up your mythology, your story that you find yourself in and that defines you on an individual level. But not all symbols are benevolent in the sense of our experience of them. Imagine the symbol of a drug in someone’s psyche. The high that you have when you spike Heroin is called “Chasing the Dragon”. That is obviously a symbol of some type of experience which you cannot truly know. This type of symbol could shatter the ego. The symbol becomes stronger than the ego and the underlying complex possess the individual. Symbols have the power to move us into the future. Whether we are stuck or find ourselves in a dilemma or are just going about our lives, these symbols contain a promise of something new in the future. Often we are desperate for a sign, but instead we receive a symbol. If you are able to recognize the image (idea/song/fantasy) as a symbol and not a sign, the unconscious will send you something new that will move you along to a better solution. The symbolic way allows for the possibility of real change and growth in the psyche by allowing something new to emerge. This is the magic of the symbol. If you have any wish to transform or grow or change, these symbols are key to the process. Sometimes they lie within us for years before we give them attention, but other times they are nowhere to be found and the only way to get hold of them is to engage in the world and hope that you get the image from someone, something or somehow. Thank you for that. Was very informative and a good explanation of the difference between signs and symbols. Many thanks, an excellent discourse, finally understood the difference. and it ties in with the use of symbols to manifest a change.. Thanks. I’m having to go through some changes and what you wrote made immediate sense. I’ve now been able to identify some that will be helpful to me… I was vaguely aware of their importance but can understand more clearly now. I’ve never thought about how symbols have the ability to energise us. Thanks a lot for that. There must be a symbol in it. All of a sudden, this concept is crystal clear and very simple to understand.